SKU: ArduCTC101. Category: Popular With Educators. CTC 101 is a modular STEAM program consisting of a toolbox with more than 25 projects and easy to assemble experiments, an online platform, and guided educators support. Creative Technologies in the Classroom 101, or CTC 101, is Arduino’s one-of-a-kind STEAM (Science, Technology, Engineering, Arts, and Mathematics) program. Tailored for students ages 13 to 17, CTC 101 is the ideal professional development program for educators. CTC 101 has been certified by the Finnish Kokoa Education Standard™ that guarantees high educational value and robust pedagogical design on global learning. If you are interested in the CTC 101 program and want to know more about it, please scroll down and sign up for one of our webinars in English, Spanish or Italian. 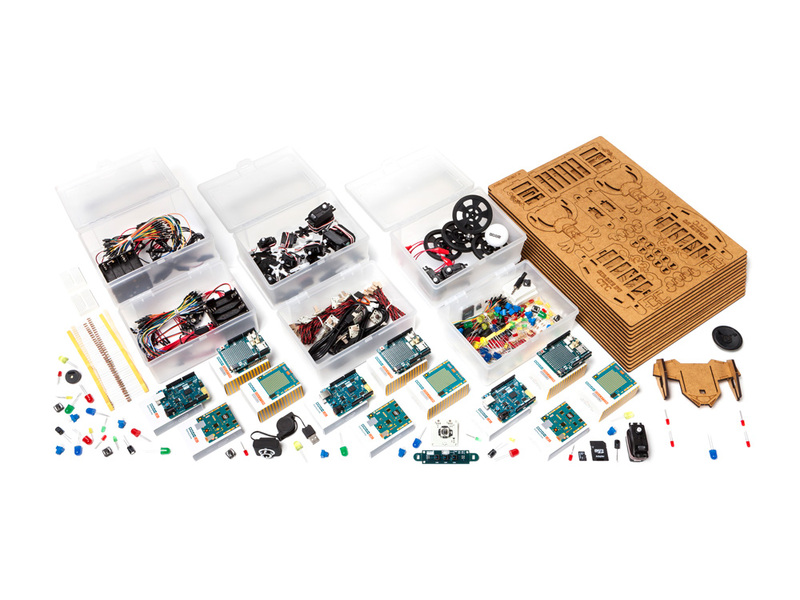 TOOLBOX: More than 700 components for a class with up to 30 students. ONLINE PLATFORM: Access to the Arduino Education Learning Management System with step-by-step instructions and lessons for more than 25 hands-on experiments based on themed modules. SUPPORT: Guided educators training, live webinars, and forum monitored by Arduino Education experts. Six Arduino 101 boards: one of the most powerful Arduino boards for Education, it includes wireless communication (Bluetooth) and an integrated IMU (Inertial Measurement Unit). They are programmable, able to read inputs (e.g., light on a sensor) and capable to control outputs (e.g., activating a motor). Six Arduino Education shields: add-on boards that connect to the Arduino 101 and UNO boards to extend their functionality. The Education Shield is a custom-made shield designed by Arduino Education specially tailored for educational purposes to enable quick and easy learning while building projects. More than 10 mini breadboards: used to make circuits easier to build. They can be either attached on top of the Education Shield or used separately to connect other components. Set of electronic components: used to create interactive electronic circuits, includes resistors, potentiometers, LEDs, push buttons, capacitors, and diodes. Set of plug and play modules: sensors and actuators that include the necessary components onboard so they can be connected to the Education shield board directly. Modules include a joystick, light and tilt sensors, and an infrared array. Set of sensors and actuators: sensors include light, knock, touch / capacitive, and infrared. Actuators include standard and continuous servo motors. Set of batteries: includes both 9 V and 1.5 V batteries, and 4-slot and 8-slot battery holders. Media and storage: include webcam, SD-card and a speaker. The Education Shield has an SD card reader and an audio connector. Set of cables: include all the cables needed such as USB cables, jumper wires, module cables, battery snaps, alligator cables and single core wires. MDF parts: project building involves laser-cut MDF parts. There are more than 10 different projects that can be built with this set of parts. Storage and sorting boxes: electronic components can be sorted inside boxes according to their functions and sizes. After MDF parts are removed from their frames, they can be stored in the resealable storage bags to keep them organized for later. The sorting box with dividers can be used to organize small components. © 2017 Duck Learning. All rights reserved. LEGO, the LEGO logo, DUPLO, SOFT, and MINDSTORMS Education logos; the Brick and Knob configurations and the Minifigure are trademarks of the LEGO Group. © 2017 The LEGO Group. All rights reserved.